I missed the previous Bake Along for rugelach as my attempt wasn’t very successful… A little disappointed and discouraged over the bake, I was very delighted when I noted that the next Bake Along is a chocolate pound cake! Chocolate always has the ability to pick me up, does it have the same effect on you too? This chocolate cake requires the cocoa to be dissolved in hot cream, but if you don’t have cream on hand, water or milk will most likely work just fine. It is a very simple cake to put together and to up the chocolatey bar, I threw in some dark chocolate chips – yummy and it certainly brightened my day! 1) Sift the cocoa and add hot cream. 2) Mix to get a smooth paste. 3) Cream butter and sugar together. 4) Beat in egg and vanilla extract. 5) Followed by the cocoa paste. 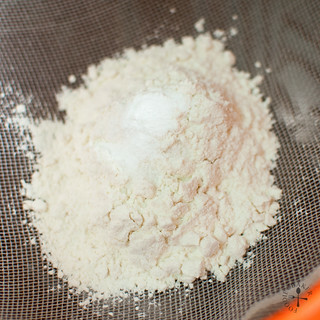 6) Sift in flour, baking powder and salt. 7) Fold in the chocolate chips. 8) Scoop and bake! I’m submitting this to Bake-Along hosted by Zoe from Bake for Happy Kids, Joyce from Kitchen Flavours and Lena from Her Frozen Wings! Preheat oven to 170 degrees Celsius. Line a muffin / cupcake tin with muffin / cupcake liners. Set aside. 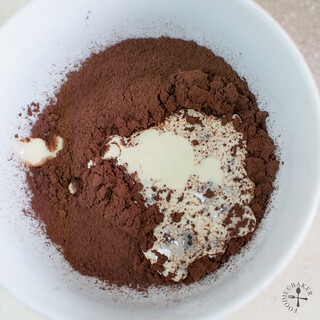 Sift cocoa powder into a small bowl to get rid of lumps. Measure the cream in another small bowl. Heat it up until hot but not boiling in a microwave or place it in a pan of simmering hot water. 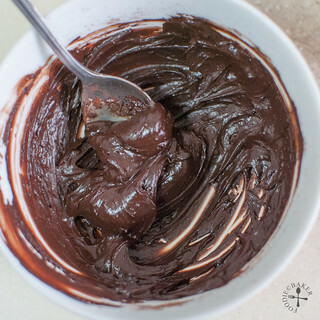 Pour the cream over the cocoa powder and mix with a spoon until a paste is formed and no trace of cocoa powder is left. Set aside to cool slightly. 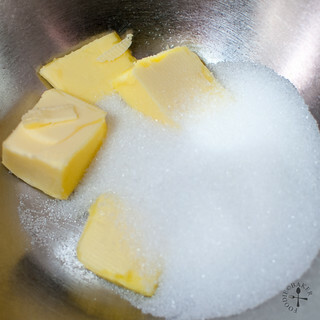 Place the butter and sugar in a mixing bowl and beat with an electric mixer on medium speed for 3 minutes. Scrape down the sides and beat for another 2 minutes on high speed until light, pale and creamy. Scrape down the sides. 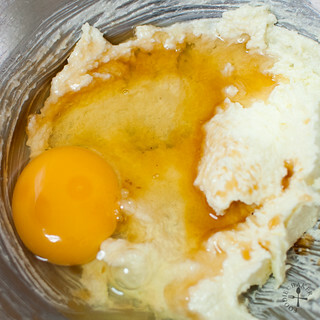 Add in the eggs one by one, beating on medium speed for 1 minute and scraping down the sides before adding the next egg. 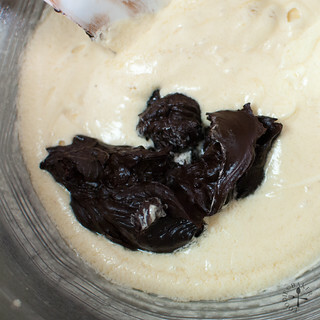 Beat in the vanilla, followed by the cocoa-cream paste until incorporated. Sift the flour, baking powder and salt directly into the mixing bowl and beat on low speed just until incorporated. 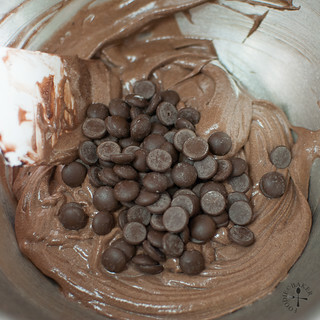 Add in the chocolate chips and fold in with a rubber spatula, scraping down the sides and the bottom of the bowl to ensure batter is well-mixed. Divide the batter among the liners (mine is ¼-cup of batter per liner) and bake for 18 to 23 minutes until a skewer inserted into the centre comes out clean. Remove the cakes from the tin onto a wire rack and let cool completely. Store in an air-tight container at room temperature for 3 days. The cake will last longer if you store it in the fridge, but let it come to room temperature before serving. Hi Jasline, I think this chocolate cake looks delicious! I like the fine crumbs alot! 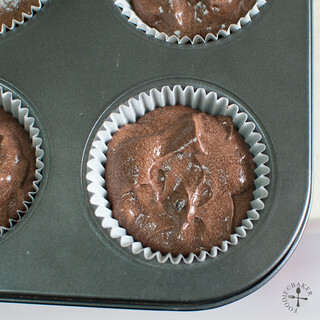 Good idea to bake into cupcakes and adding more chocolate chips! Yum! yes please.. i want 2 cupcakes. 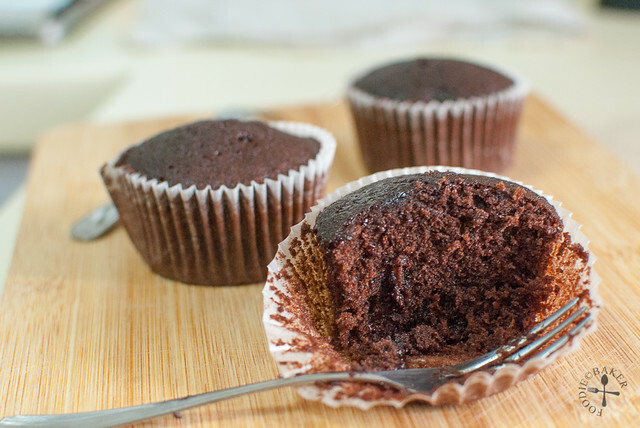 Adding chocolate and making cupcakes, Jasline, are great twists to an old favorite, pound cake. I’ll take mine with some fresh raspberries and a bit of whipped cream, please. Hi Jasline, I baked mine yesterday and almost ruined it. I like you made this into cupcakes. yessss chocolate pound cake!! this looks and sounds soooooo delicious! Your cupcakes look so moist and delicious! I love that they’re in muffins! Nice cupcakes, and very rich…I love the intense chocolate color. zoe will agree very much to your’ pick me up ‘ statement!haha! ok, dont talk about zoe, otherwise she says that i’m kaypoh-ing around…:D always appreciate your participation and time taken to bake these wonderful looking chocolate cake with us. Sorry to hear about your rugelach, hope the next time when you attempt it again, it will be a successful one. Hi Jasline, your chocolate pound cake is awesome. Very chocolatey, great to go with coffee. 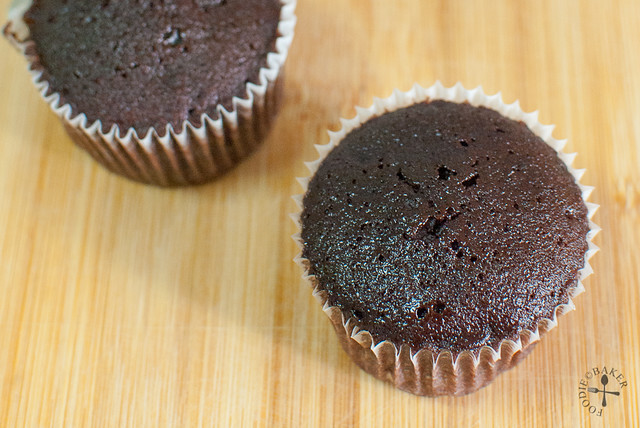 These are very yummy choco cupcakes. Look moist and delicious! These makes very lovely cupcakes! Adding chocolate chips makes it extra chocolaty, a very nice addition. Hi Joyce! Woah you are very fast! Haha. Thank you for the compliment! I hope to attempt rugelach again in the future, but wonder when the motivation to do so will arrive… haha!